Baseball season is fast approaching. So fast, in fact, that the first game was actually played last night/this morning in Japan. The excitement that many feel with spring training is sure to quickly devolve into despair with the first 2-game losing streak of your favorite team. But, until then, anything can happen! This is the year! What it has also meant these past three seasons is a Topps Now spring training set is released. Even though I’m not watching the games for now, I still pulled the trigger on the set this year. 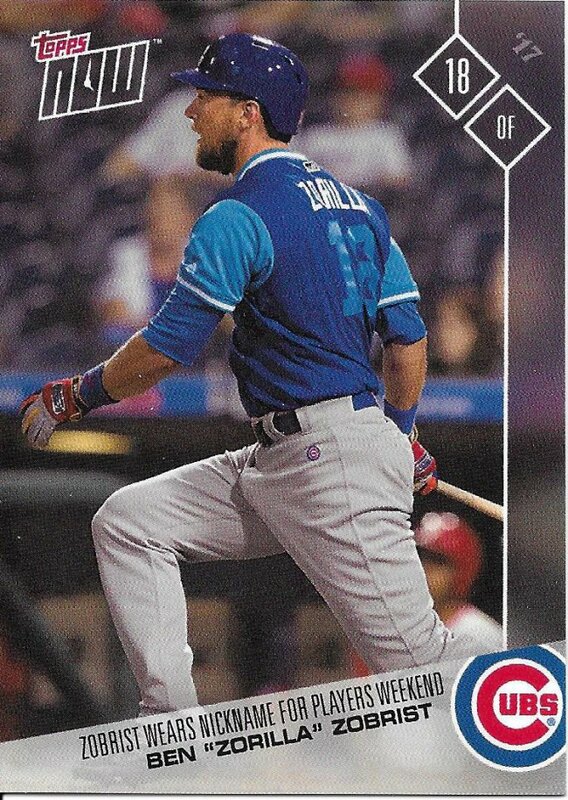 There’s only one of five autograph subjects that I don’t collect (David Bote), and there are still enough players on the team that it seemed worthwhile. I can always sell the Bote auto if that’s the one I get. But that’s this year’s set which is a ways away from shipping out. Last year, I showed the first version of the set and my Jason Heyward auto. We don’t want to skip over year two. 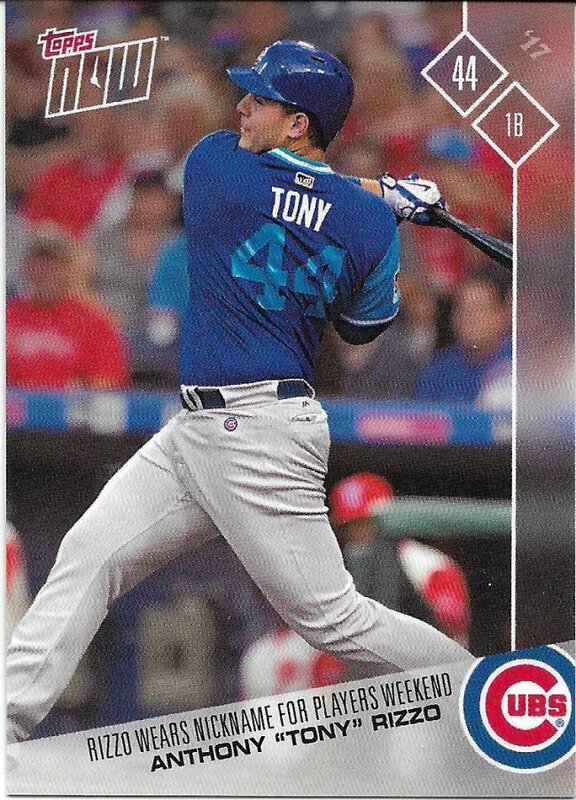 But first, I’m also going to show the cards from the first Players Weekend set. 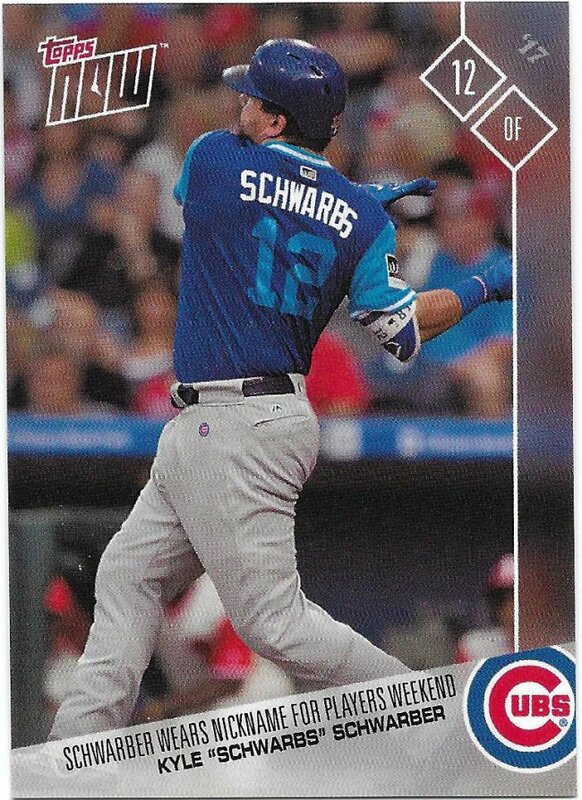 I don’t buy singular cards through the various Topps programs, but these multi-card sets seem to be just barely worth it for me. This was a fun event, and I’m glad it came back in 2018. I see that little logo on the pants. That exclusive is still worth something! I especially liked the uniforms they used. Can’t go wrong with baby blue. This is the only one that clearly shows off the patch that became replicated in blaster manurelics. My biggest complaint about this set is that the photo selection isn’t too exciting. …twice. I already forget Rene Rivera was on the team. I sort of remember the grand slam. If you’re curious, this is what the backs look like. They have a little holo logo effect that isn’t coming across in the scans that act as a watermark. It’s nice that Rivera got a face shot on the back of his bonus card. On to the main attraction. I’m not going to bother splitting these up. 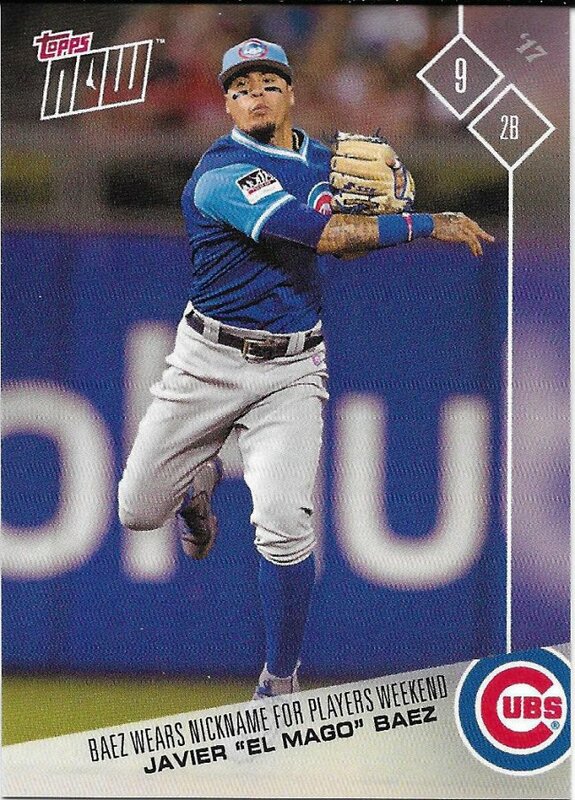 The set gives people their first glimpse at what the Topps Now design will be for that year, even though plenty are released before these get shipped to people. I do appreciate that the pictures are at least partially from spring training games and workouts. There was also a bonus card for this set as well. 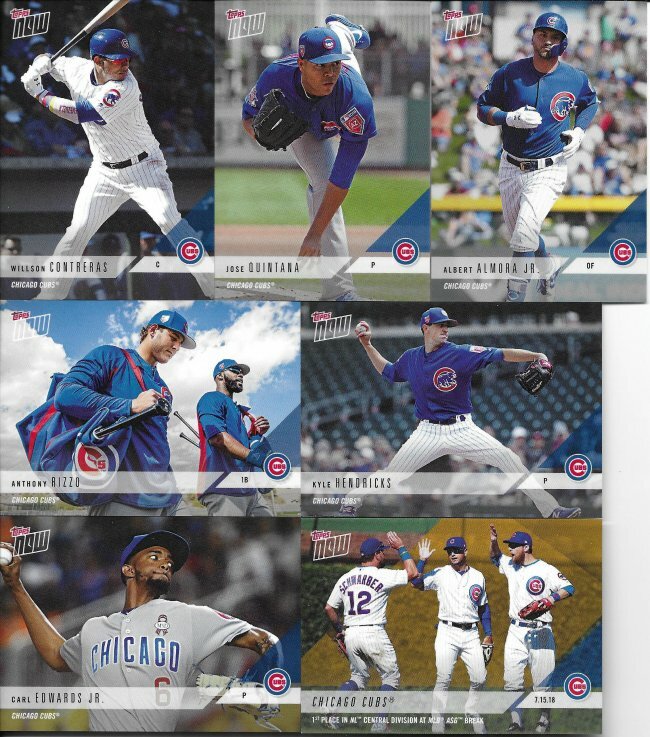 The Cubs managed to get 1st place in the NL central by the All-Star break and so we got that bonus card. There could have been other bonuses for a no-hitter and a cycle and I think something else, but obviously this was the only one to hit (and it was close thanks to those Brewers). So, I buy the autographed version of this set. Like I said before, I got Heyward in the first year. On offer this time were Rizzo, Bryant, Contreras and Baez, and who’d I get? Yup, Ian Happ. I honestly don’t remember his name being on the list of autograph subjects initially. I looked at the page after this arrived and his name was there. Maybe I just assumed I would beat the odds and get someone I collected. 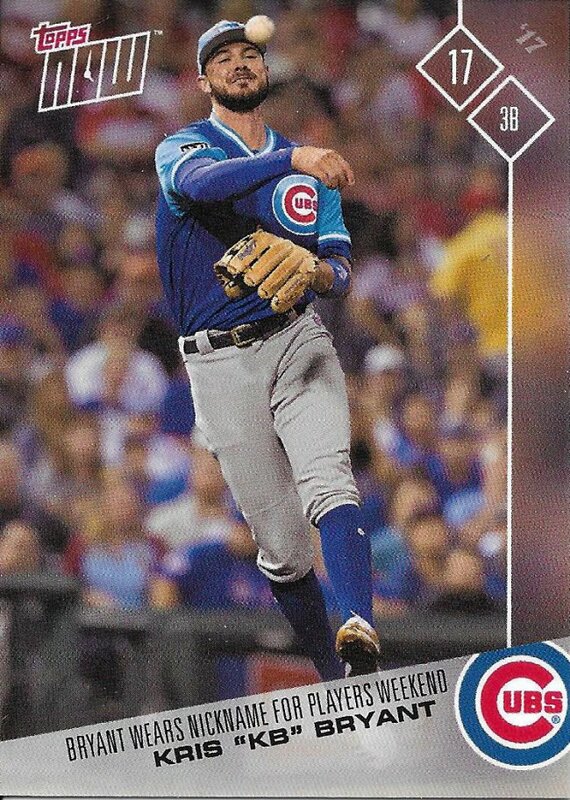 Not that I won’t collect Happ, but that would only happen if the Cubs win another World Series with him on the roster. For now, this is up for trade or sale if anyone happens to be interested. Will lightning (in the form of 20% odds) strike twice with the 2019 set? I guess I’ll find out in a few months when it arrives. 195 left to show before taking Sportlots delivery.